The strange tiny sculpture, shown above combines all 3 elements of the Surf Turf & Sky master class recently run by Basil Kardasis for Heart Space Studios in Bristol. In fact looking through all my 120+ images taken throughout the 2 days, this is the only piece of work that uses the 3 materials together. The participants came from several disciplines, but whether, professional or amateur makers, all were highly skilled makers in their chosen craft. 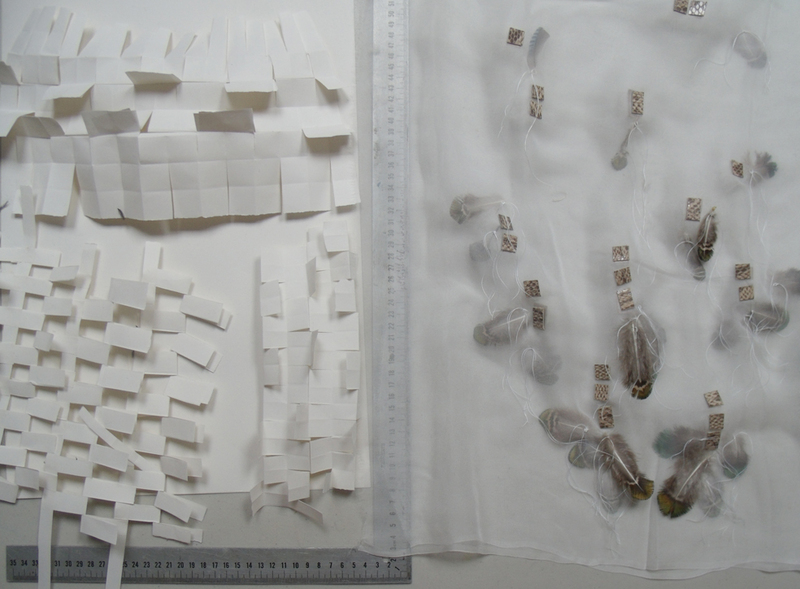 They were tasked with creating 3 samples using any of the materials on offer, in order to develop them further to enable them to be exhibited at a later date. 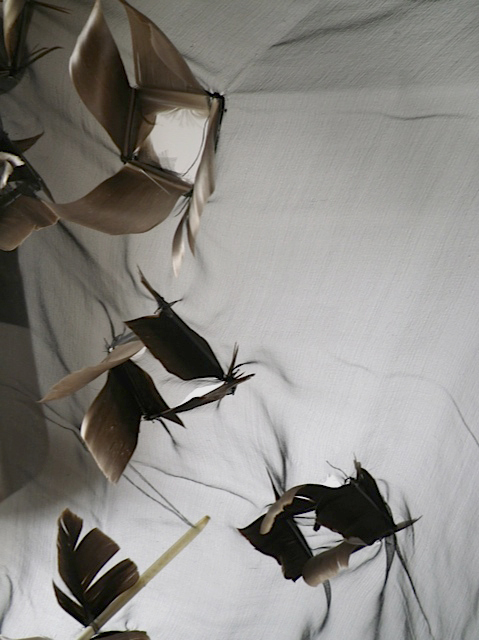 Kari Furre’s black chiffon and feather fabric. 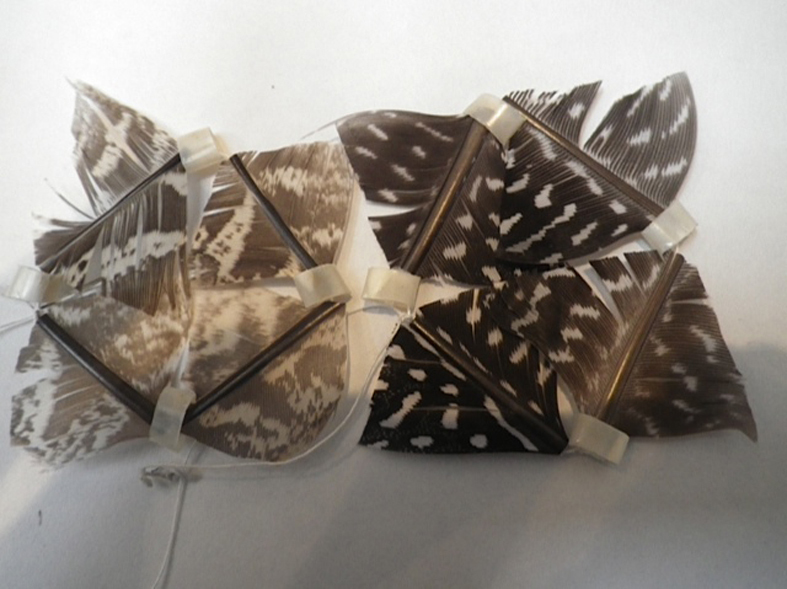 I know from my own, hard won, experience that when faced with strange and challenging materials the mature maker will often instinctively return to the core of their own experience and utilise familiar techniques to explore the new materials…resulting in imaginative samples and ideas. This is the main reason why I wanted to develop master classes for Heart Space Studios, to introduce new ways of thinking to mature makers through unfamiliar materials ( rather than the more usual workshops that teach new techniques). 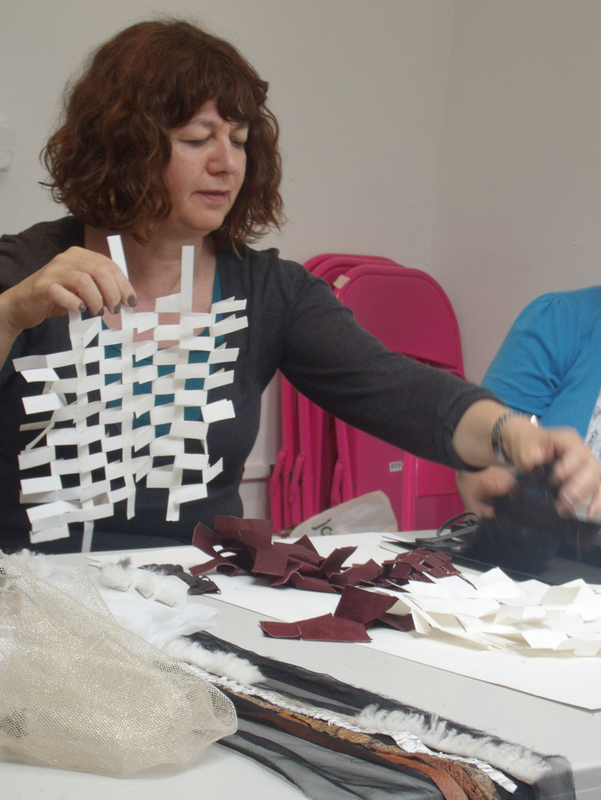 And Kari certainly made completely different fabrics and samples for the group to wonder at. 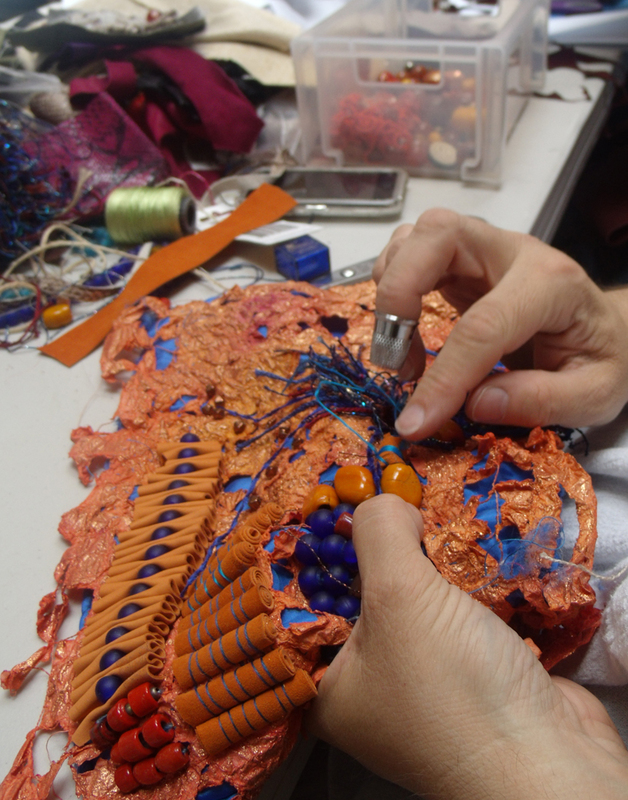 The same behaviour can be seen in Ann Rippin’s embroidered collage of silk, beads and, as far as I can see, anything but leather, fish and feathers for her first day’s efforts. To see and read a more insightful record of her experience, click here Ann Rippin’s blog. But even though Ann didn’t use much of the unusual material provided by the workshop she certainly became inspired to develop wonderful work from things she had stashed away not knowing how to develop them. On the second morning Ann came in with a half made sample which she had unearthed with ideas for its development very late the night before…. She became fascinated by making leather and thread beads after seeing one of the research books I had brought in for everyone to delve into. 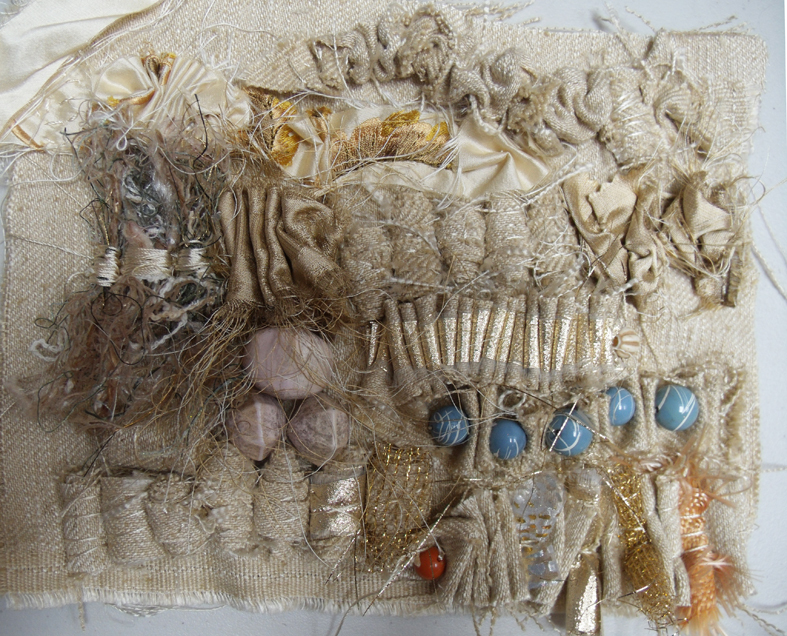 What is interesting is Ann is primarily a quilter , or patch-worker, but here she has made and applied 3D objects to her work, perhaps a new way to develop? She spoke of her work being “excessive” and a good exampler of how to escape the atmosphere of parsimony engendered in the present economic situation – a wonderful reason for making any work. 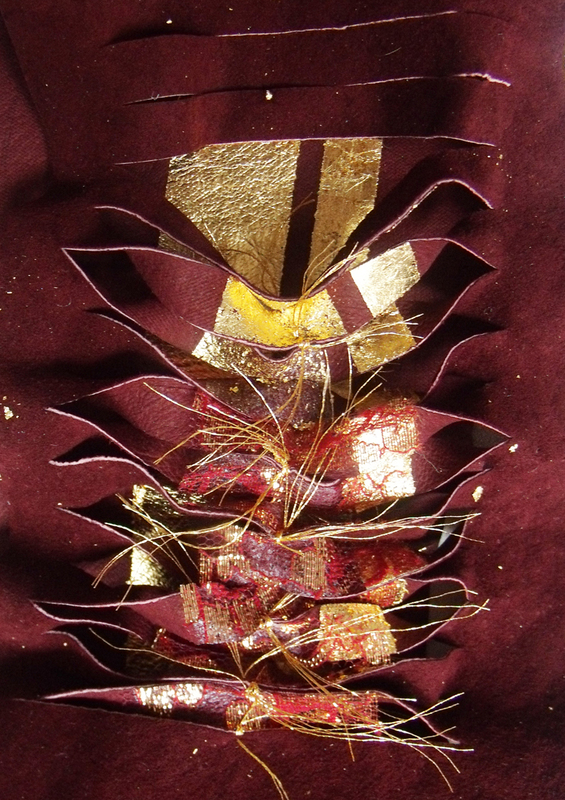 Another stitcher, Sally Sparks, found a way back to hand stitching after experiencing several years working with other materials and techniques, and said her first day was “a disaster”; she has recently been developing much of her textile work from her own inspirational photographs of rust…. but now her work was pale and subtle in its colouring as she rediscovered some of her old materials. She was very nervous of using the fish skin, like everyone else she found that the very preciousness of the material was a barrier to experimenting with it. Realising this in advance Basil and I offered card and other fine leathers for people to work with. 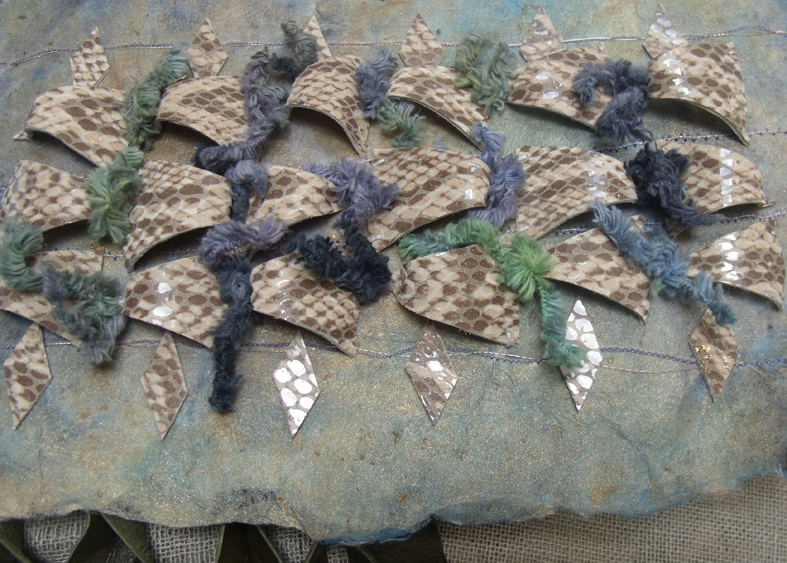 Sally Sparks – leather and chenille applique sample on her own hand made paper. nevertheless Debbie made several interesting samples that she can develop further when she has had time to assimilate all the ideas offered by the experience. 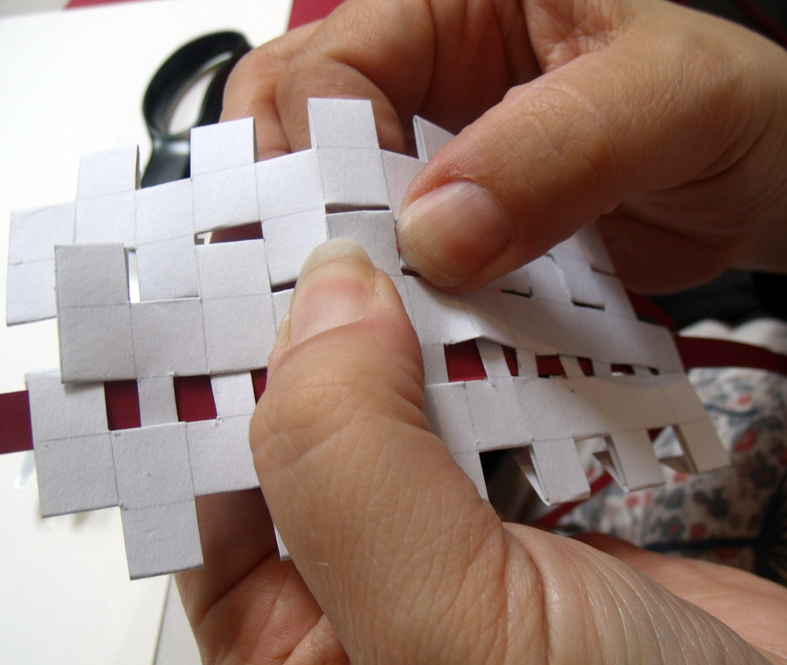 Several people became immersed in weaving and folding card to develop leather and skin fabrics, Sue James, a technical lecturer at Glamorgan university began a fascinating small scale interwoven series of samples using card, as did her colleague, Tom Clulee, the Award Leader in Fashion at Glamorgan, who made a good start with developing an interlocking star shape in cardboard like Islamic patterns…unfortunately he was called way from the class after the first day so Basil and I sent a “care package’ to him to help develop his ideas in his own time, we can catch up with him on a later post. 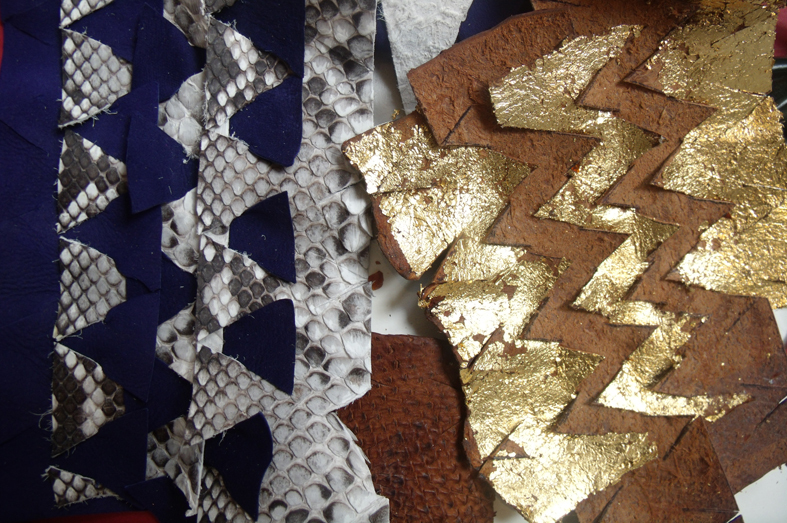 But Sue persevered in finding ways to make sheets of viable leather ‘fabric’, the beauty of which lies is the fact that each side has a different pattern, especially when gilded..
Susan James snakeskin and leather samples showing the same pattern on the reverse of a fish skin with gilding. 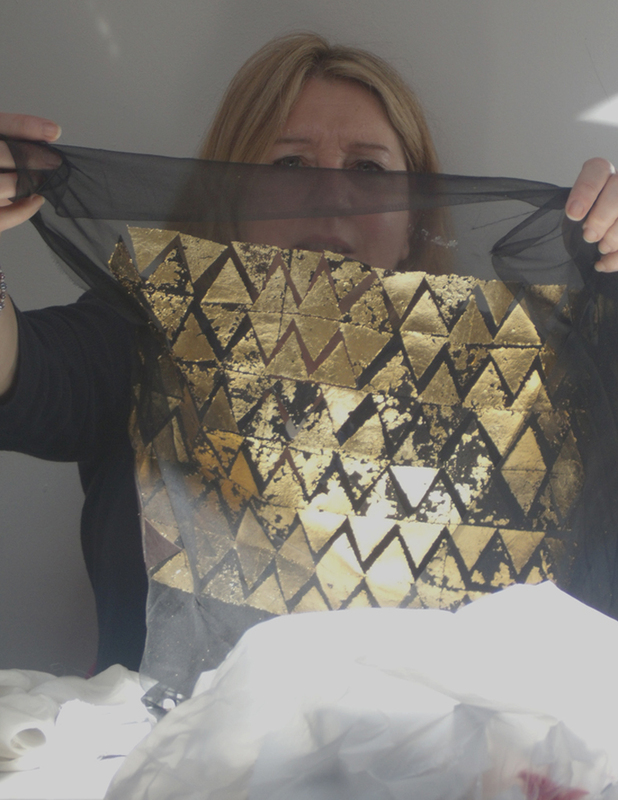 Her main aim now is to make a fabric that will be molded to ‘sit’ on the body as a garment without it being cut and stitched in the usual manner – so her technical expertise has come to aid her development for these unusual materials. 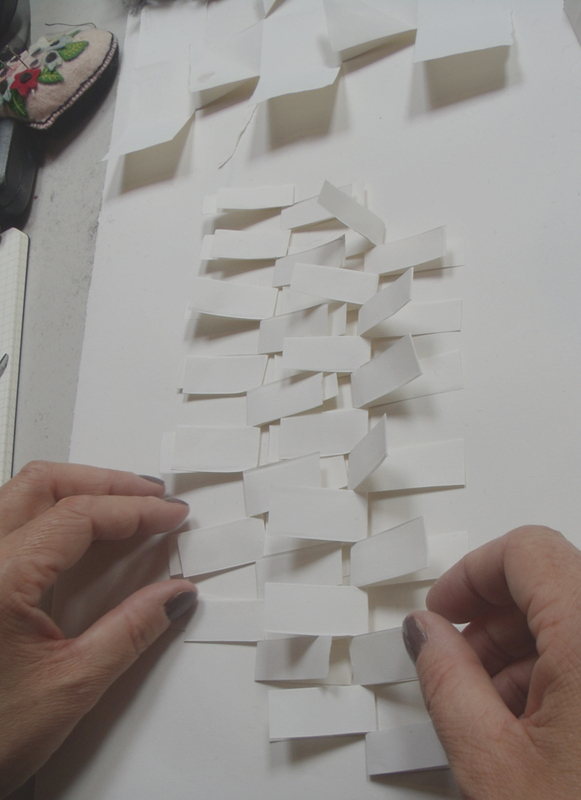 Dawn Mason, who is the Award Leader of the Drawing and Applied Art programme at UWE, Bristol is a textile maker currently working with hand stitched papers who also decided to weave card to develop new ideas. 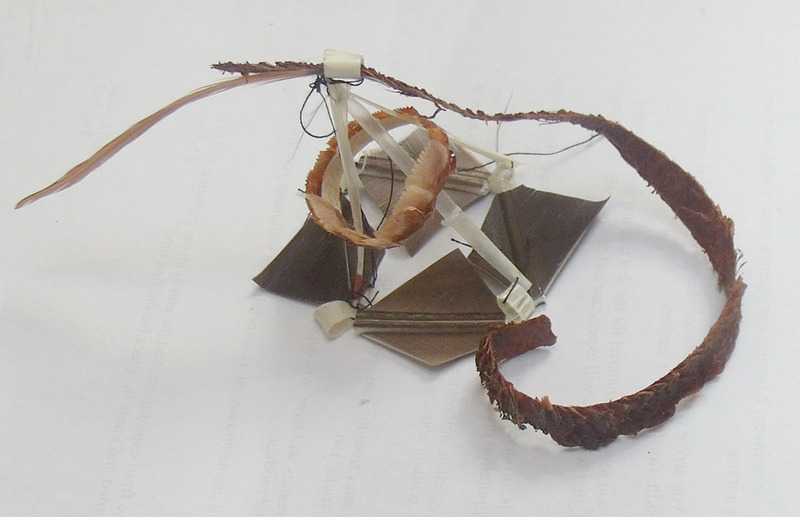 She worked by referencing traditional fur cutting techniques that Basil had shown in his introduction; several samples of cut and woven leather were shown at the end of the session and she is now intrigued by the articulation achieved – she also stated that she had made a determined effort to change the way she usually waoked and to just experiment with “something that feels alien” . Dawn Mason showing her samples and experiments at the end of the workshop. Sitting next to Dawn and dealing with alien ways of working was Jules Tenebrae of Lux Tenebrae and if you go to her fascinating website you will see how far she travelled from her daily working life ..
Well maybe not, we are still in the realm of fantasy and femininity. 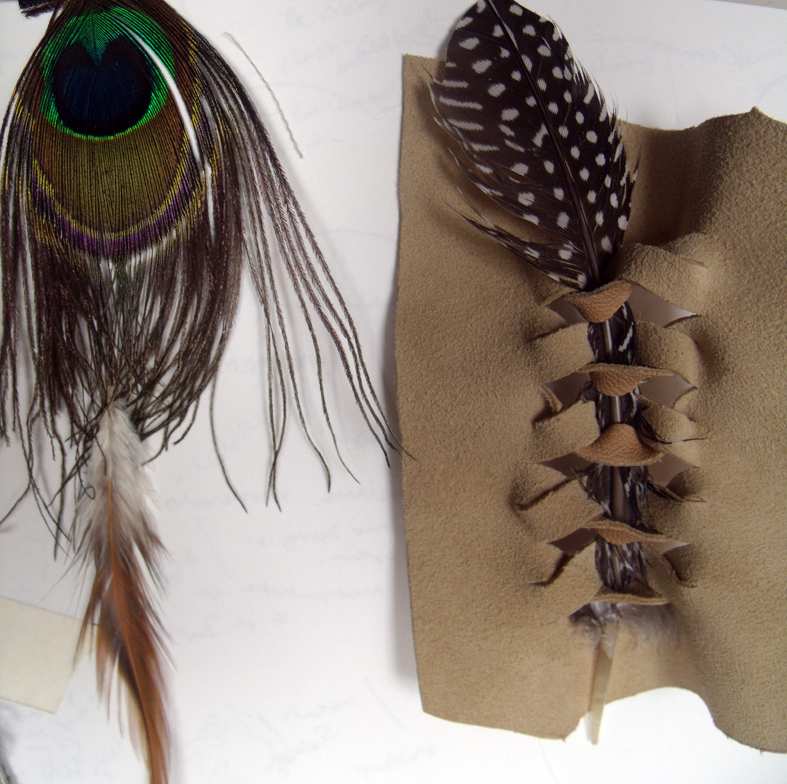 Jules, a corsetier, made the most diaphanous fabrics, weaving and stitching soft feathers and leathers together, and she also gifted the class with extra snake-skins, leathers and seudes from her own workrooms for the second day. She said that she felt liberated as we were not “allowed to produce a product” and this was initially very difficult( I agree, once a designer always a designer). She worked from the idea of ‘Treasures on the Beach’ and started a long wavy piece of work that flowed and undulated when she hung it up, in fact all her fabric samples where very floaty and at the same time organic, at complete variance to the usual rigid corseted and structured leather clothes she sells. And now I look at her final sample I see that she also has incorporated the 3 materials, she has strips of snake and fish skins, fur, leather strips stitched with feathers onto silk chiffon. 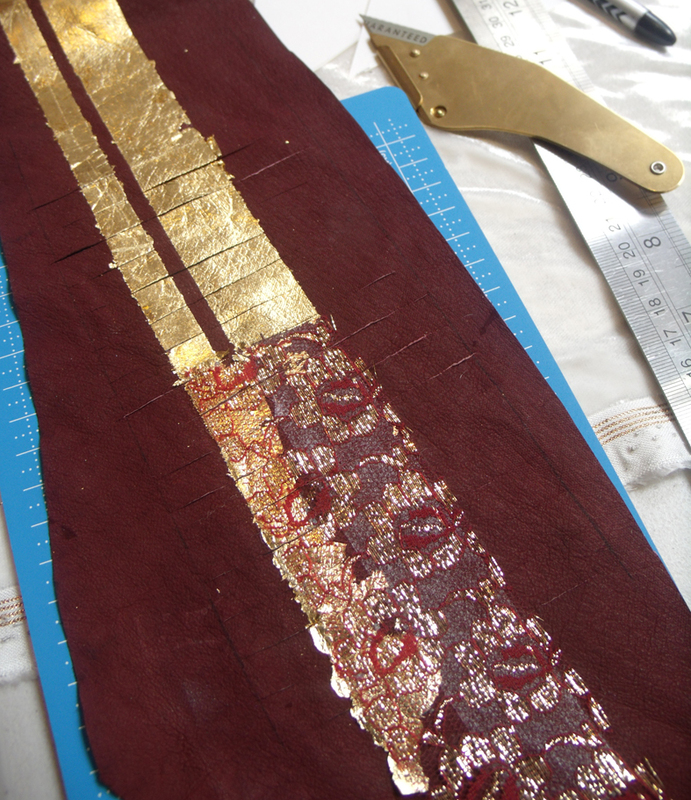 Lisa Keating prepares leather with metal leaf and lace. and the small chiffon fish skin piece from Swedish students, which really was inspirational for many of the other people in the group. 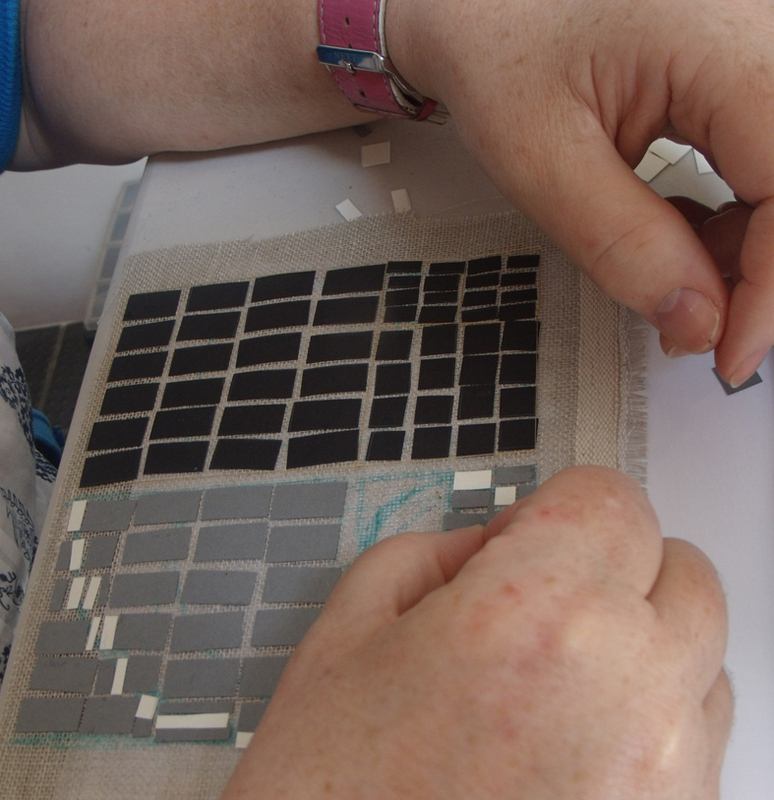 Lisa made a simple and delicate spotted fabric using the iridescent fish skins like sequins. It is a seemingly simple technique but requires a great deal of precision and patience. 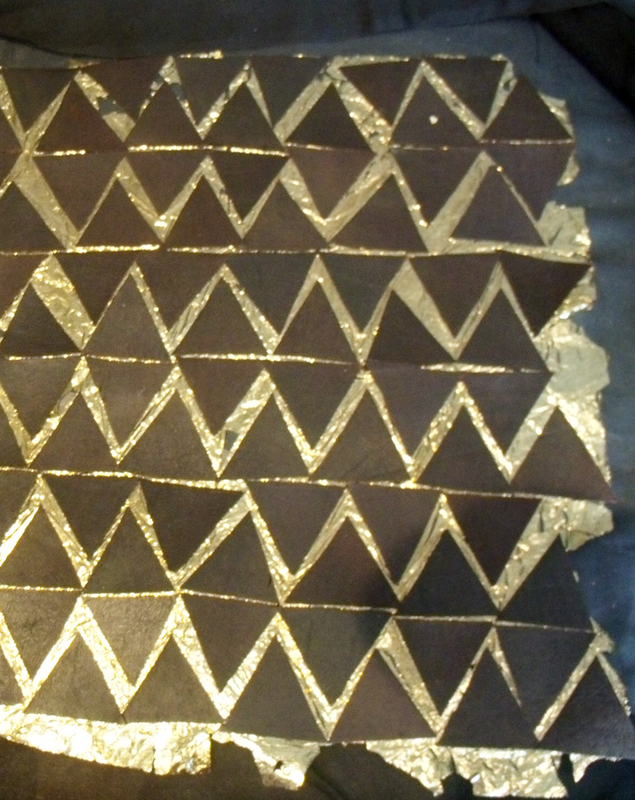 The cutting and sticking of the fish-skins to the front and back of the material is really labour intensive. 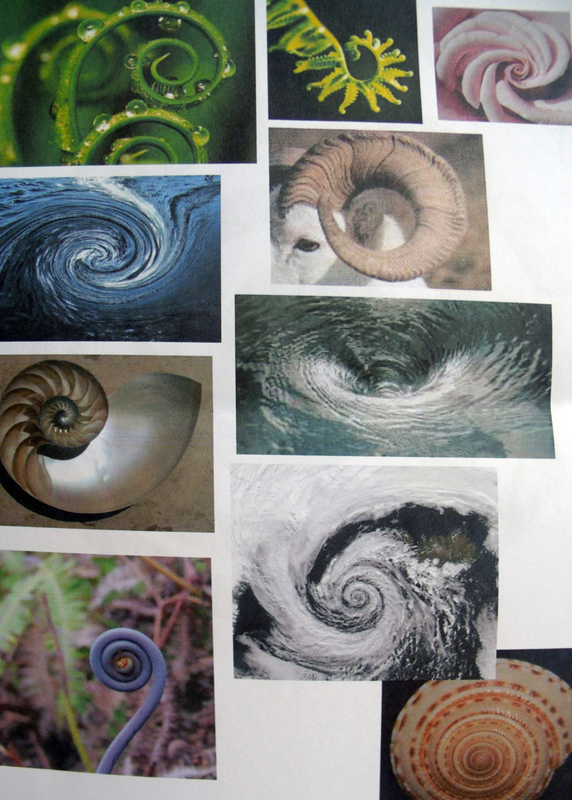 Libby Butler, a textile maker who makes truly for the love of it – became interested in working with the Fibonacci spiral and came on the second day with a storyboard from which to work a series of samples. she set to work knowing that she is in for a long time consuming period of developing this intricate idea into a viable fabric. Meanwhile, textile maker Anne Harrington tried to simplify the making process by gilding the back of the leather using adhesive that could be permeate through the chiffon. with really interesting results that beg to be developed further….. 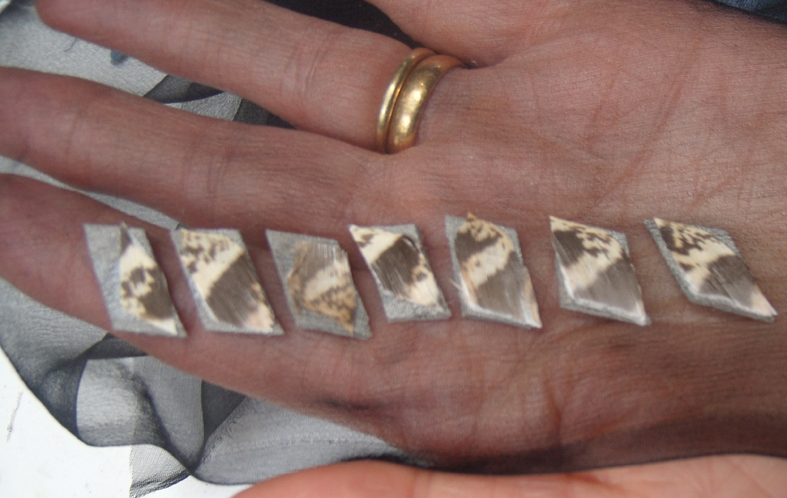 These experiments are the first samples in an ongoing process to an exhibition in London later in the year; we aim to help the makers develop new works inspired by and exploiting the qualities of these unusual materials….for Basil Kardasis’ next class he is working with Vellum . 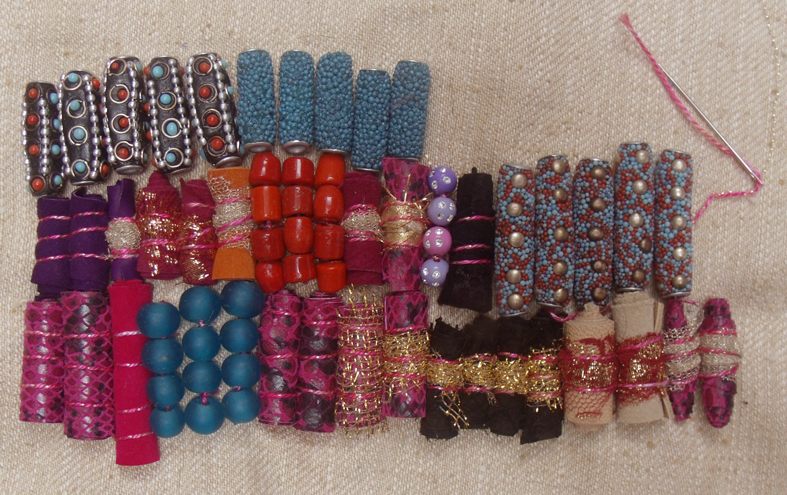 Categories: Heart Space Studios, Master Classes, Stitching | Permalink.